Organizations that enjoy a long history of success have usually figured out how to enable and integrate ongoing creativity. The notion of re-inventing yourself. You might be surprised to know that these types of organizations are in the definite minority. Unfortunately, some people believe that creativity is a rare attribute possessed by only a select few … “the purview of the Chief Creativity Officer”. I find this view to be a contradiction, because it has been my experience that people are curious by nature, and typically full of new ideas. It is also a commonly held belief that people are creatures of habit, and they dislike change. And most management pundits will tell you that the only constant thing out there is change, and that you must adapt or die. Despite these observations, many large organizations continue to find it extremely difficult to create new products, markets, campaigns, processes and so on. This is especially true when it comes to leveraging the new Social Media and Digital Services Universe, which ArCompany believes is the untapped conduit for raw, customer-volunteered information. This information is high quality and often unseen by many companies. So what is the root cause for this tendency to resist creativity and not implement change? I suggest there is one primary root cause: the design of organizations. Most large organizations that recognize this creativity shortfall, try to jump-start creativity by creating small “outboard” organizations to develop new products or new processes for performing operations. It is rare, however, that these “entrepreneurial enclaves” impact the long term core operations of the larger “mother ship” organization. Once they begin to demonstrate success, they typically continue to be held at arm’s length or are, in fact, further removed from the “mother ship” by being spun off into separate entities. The result is less than optimal leverage of any new creativity by the larger organization. But assuming that we are all rational beings (which may be a leap! ), this non-integration seems a somewhat irrational action. Why does this occur? This commonly held understanding of the desired result is Vision. In these early entrepreneurial organizations, the Vision gives the organization permission to create breakthroughs. “Breakthrough Results” are defined by Mel Toomey and Ed Gurowitz of the Generative Leadership Group in their paper on Designing Systemic Change (1997) as: any result that is committed to in advance and that (a) exceeds what is predictable from past performance, even highly successful past performance, (b) makes a vital, lasting contribution to forwarding the organization’s vision and mission, and (c) leaves the organization in a new reality of what is possible in some area of performance. A breakthrough produces a significant result that is discontinuous with the past. And as these breakthroughs occur, Organizations must also regularly adjust their Vision, to make it bigger, which in turn supports the cyclical enabling of more breakthroughs. As the entrepreneurial organization first begins to evolve toward a larger organization, something profound occurs. The organization moves to protect its breakthrough result (e.g. new product, process, campaign, etc.) by creating and institutionalizing processes that move the breakthrough result from simply being a possibility to being feasible, and then ultimately to being an implemented certainty. This further leads to operating processes that dissuade expanding the Vision and are intolerant to change in order to protect the new operation. The organizational culture shifts to one of not inviting creativity and new ideas because they could threaten the new product or process that is now a “money making” certainty. The organization then begins to slowly nurture the new product or process through slow continuous incremental improvement activities (See Edward Deming and the TQM – Deming Cycle), but as a protection measure, shuts out additional radical activity that could produce new creativity breakthroughs. You have often heard of the large company that acquires the smaller innovative organization, and then eventually kills it by accident. But this is not an accident. This tends to occur because of the installation of these new restrictive processes to protect the breakthrough, as mentioned above. Don’t get me wrong, organizations need to practice continuous improvement, but to ensure real long term success, the organization must be designed to create an ongoing series of breakthroughs, in parallel with a more slow and steady diet of continuous incremental improvement. And as said earlier, a conscious cyclical approach to creating and updating the Vision is the mechanism for enabling breakthroughs. But what is the secret behind keeping this Vision / New Breakthrough cycle in play? 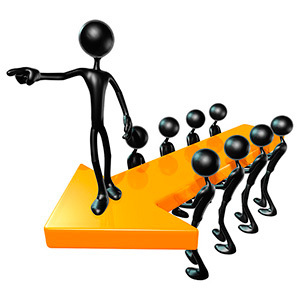 Most have come to think of Leadership and Management as specific individuals or job descriptions. In fact, it is more useful to think of these terms as verbs, or actions performed by a constantly interchanging group of individuals. I define management as the execution of the predictable to achieve desired results, while leadership is the execution of the unpredictable, yet possible. Leadership is more synonymous with breakthroughs, while management tends to be more akin to continuous improvement. Both leadership and management are actions that are required for success. 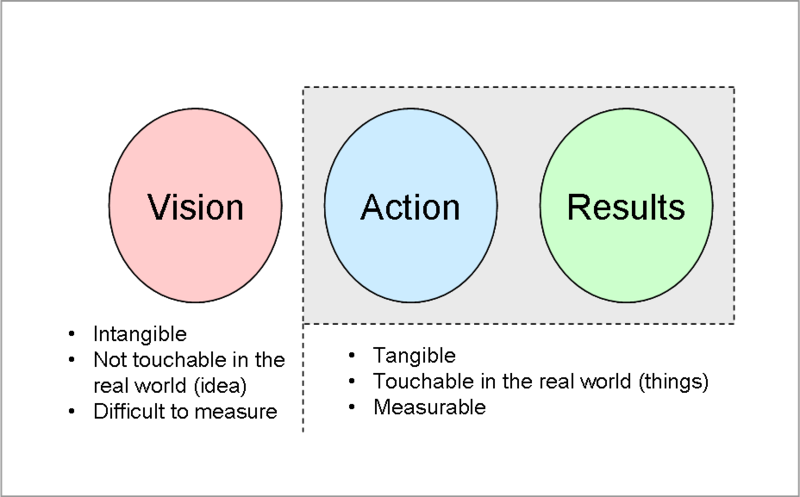 Vision sets a context for how the organization should operate, but because it is not tangible, not something hard that you can hold, and not based on evidence, it is a declaration. And much like the US Declaration of Independence, or the Nike slogan of “Just Do It!” referenced in the title of this Blog, a Vision requires the courage to simply “declare” a direction that is a breakthrough (discontinuous with the past). And usually this declaration must be done in the face of others demanding hard evidence where little exits. A Vision is a leadership declaration that clears an opening and empowers all in the organization for the creation of breakthroughs. I recommend that you have a look at the 4MQ Blog if you haven’t already read it. This process requires the following tools: a suitably sized meeting room, pad boards, two colours of markers, eyes, hands, feet, brains, loud voices and courage! Schedule a day to get the key stakeholder members of your organization together in one room (or via teleconference if it is the only option), and stress that this could be one of the most valuable days to the organization, so participation (which is different from attendance – you get a badge for that because it is easy to measure) is critical. Relax the night before with a glass of wine or single malt scotch or whatever works for you, and let the day to day activities “drain from your brain”. Hit the hay early and get a good night’s sleep, so you will be fresh and on time in the morning. Once at the session, get everyone to sit around a big table, facing each other. Typically, up to ten people is a good number for these sessions but they can be facilitated with twenty or more. You should err on being inclusive as opposed to exclusive. Given that everyone has scheduled the entire day, don’t be in a hurry to complete an agenda. Success for this exercise is not measured by how fast you can adjourn the session and get back to your emails, your tweets or to check on your own functional team. Trust that you have done a good job at training the organization for which you are accountable and that you make the biggest contribution, on behalf of your reporting team by representing them in the creation of a new vision … a new road to success. Your name, title, organization … where you hang your hat? What you are accountable to achieve? Who you represent or are speaking on their behalf? What outcomes do you want to see from this session? It may take five to ten minutes for each person, which may seem like a lot in the context of a typical meeting. But recognize these are your team members to collectively attack a Brave New World. An hour or more to complete the introductions is a small investment with a big payback. These introductions should be documented, particularly the desired results / outcomes, as you will want to measure whether these have been achieved at the end of the session. Once the introductions are complete, each person should take a marker and individually write on pad boards, a description of what you think the company should strive to achieve and stand for in the long term. It is not important to wordsmith at this stage and the vision should be no more than half of a typical 8.5″ x 11″ piece of paper. Remember you don’t have to have evidence to support your Vision, because it is a declaration. Trust that knowledge and competency of the group doing the exercise will carry the organization through to a compelling vision … Just wail! When everyone is complete (again forget about wordsmithing), each person should individually stand up and with courage and vigour, read their Vision to the others. Do this in a priority by volunteering or go around the table, but all must participate. After the reading is complete, allow everyone while they are grabbing a coffee to walk around the room and read each others Visions. With a marker in hand, all should underline the key words they see in each of the Visions. The consolidation of these Visions then begins by breaking off into three or four smaller groups (3 – 4 people) and re-crafting a consolidated Vision using just the previously underlined words. Then repeat the process of reading the new 2 – 4 re-crafted Visions to the group, by an elected representative from each group. Discuss these Visions as a a broader group to gain alignment. Here is when the wordsmithing comes into play. After having spent the better part of a morning or afternoon on the above process, the group will have generated some trust across the members. Elect two people to take the 2 – 4 “un-wordsmithed” Visions away and consolidate and wordsmith with one week. Trust that they will do a great job! Once completed, redistribute to the group for a last quick review and then trust it is ready for the organization. A Vision is not a tag phrase and should be suitably detailed to convey a rich picture of the desired future (typically no more than a half page). And that “all things are permanent, until you decide to change them” … so take every opportunity to update the Vision, because it is the Organizational Compass. Now a few more items to consider when creating an organizational Vision. I have facilitated a number of visioning and strategy creation sessions for a variety of companies, both big and small and with a wide range of business focus. Particularly for large organizations, it is important to note that what the CEO sees and does is very different from what the front line worker sees and does. But it is important to tie them together with the same Vision. FedEx used to have its tens of thousands of drivers (worldwide) able to recite the company vision and explain why the it was important. In order to help people of different levels in an organization understand perspective, I once took a mixed group of senior executives and front line workers of a large Toronto based company on a tour of what was then known as the Sky Dome Arena (now Rogers Centre). We began the vision facilitation session in one of the arena conference rooms by watching the excellent video entitled Powers Of Ten made by Charles and Ray Eames in 1977. After the video, we went out to the floor level of the arena, where they were preparing for a World Wrestling Entertainment Inc. (WWE) event and the ring was already set up. Up close it looked fairly large and colourful … suitable for the spectacle that would follow. We then climbed the various levels of the Rogers Centre by walking the stairs right up and onto the movable roof rafters, a full 310 feet above the floor level … that’s a 30 story building that can fit into the arena. Perched precariously in a “screened in” walkway with see through steel mesh bottoms, high above the arena floor, the wrestling ring looked like a postage stamp. I pointed out to the front-line workers with us that this was what the organization often looked like to the executives, while the floor view was what the workers were more familiar with, and somewhat alien to the executives. To this day, I still get comments from the attendees of that session that the exercise cemented the importance of appreciating the different perspectives of all in the organization. I would like you to consider one other exercise when thinking about vision. In a large organization, it is often difficult to engage a wide number of people with differing perspectives into the session to create the Vision. So, as a result the senior team will often craft the Vision and publish it in the form of a framed letter that each person in the organization can hang on the wall in their view. I invite you to try the following exercise. In your home or office, hang a piece of art that you have created next to the purchased art that already hangs in your home. Over a period of several months, the purchased art will tend to blend into the background (unless it is a daVinci or Van Gogh original), but your creation will continue to hold your interest day after day. This is because it is your expression and will always be relevant to you. Then, go into your office or workplace and hang the framed company vision on the wall. Guess what … over time it too will blend into the background if it does not have your contribution. To correct this, encourage all of the organization’s employees to understand the Vision crafted by the executives, and then to re-write in their own perspective and circumstances. They should then hang this personalized version next to the published organization Vision. Every day before people start their workday, they should read these two visions to help frame and guide their actions and results for that day. The two Visions answer the question: Why are we here? A successful Vision should be large and one that challenges the organization to encourage breakthroughs. It is quite another matter to actually act large, because it can easily burn up all your resources. So the trick is to think big, but act focused on specific target results with controlled and measured action. Think Big, Act Small. The following illustration will help to relate the vision with the implementation. In order to be successful, organizations need to have Vision, Defined Results and the Action necessary to produce those results. It is critical to have all three of the components. If you have Vision, but no Action or Results, you are “daydreaming”. If you have Action and Results, without Vision, you are “flayling”. Make sure your results are clearly articulated and communicated and are consistent with the organization Vision. Then closely meter out your resources to perform measurable actions that produce those desired results. Creating a Vision is a lot like donating blood; it’s critically important, relatively easy to do and it’s “… in all of us to give”. Now, let’s get into action and create a big Vision with enough room for everyone to contribute! And don’t forget to regularly adjust the size of the organization’s Vision, as more and more breakthroughs occur. If you are having any concerns or questions with executing the 4MQ Process or the Visioning Process … take two “yellow stickies” and call me in the morning!